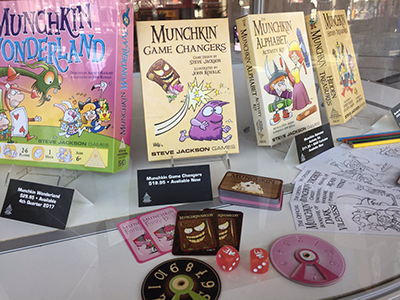 Our big assignment on Friday was the construction of the Steve Jackson Games display case. This year, I sat down and put together a quick video showing everyone not at the show a peek at what's inside the case. 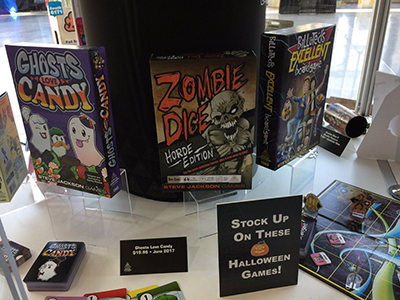 You can go to YouTube and watch to find something new for Zombie Dice, see some new Munchkin, and check out some of last year's new games – including Batman: The Animated Series Dice Game and Simon's Cat Card Game – on display at this year's New York Toy Fair. On a non-work note, I managed to make my way down to Grand Central on Friday at 5:30 in the morning, with a 1983 Radio Shack battery-operated toy in my bag, to shoot video of the toy inside Grand Central. This is a toy I photographed and reviewed last year, and the video has fewer clips of the toy in action than I would have liked. The problem with this plan came down to noise; you see, those early eighties battery-operated toys aren't exactly quiet, and the grinding of the gears echoed a lot more in Grand Central than I was expecting. When you come up from being on your hands and knees playing with a toy to find police around you, maybe it is time to stop sending the little toy crawling across the floors of a very public space . . .